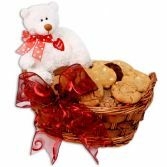 This Bakery Gift Basket is filled with a half dozen Whoppie Pies, Half Dozen Jumbo Cookie and 3 Jumbo Gourmet Cupcakes. 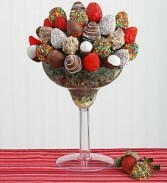 This is a Sweet gift that is sure to be loved! 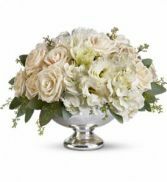 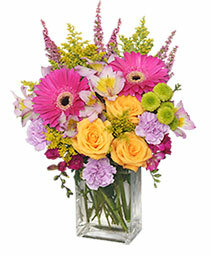 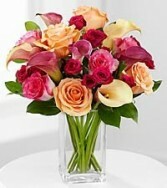 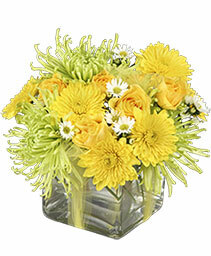 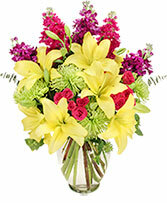 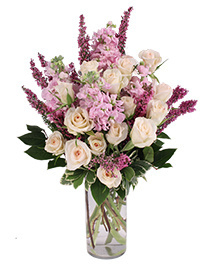 This stunning arrangement is elegantly designed with top quality roses and calla lilies. 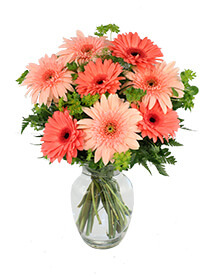 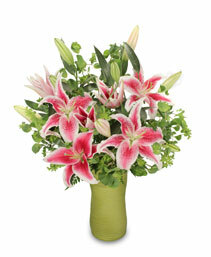 Beautiful red roses, stargazer lilies, white stock arranged in a beautiful heavy vase. Do you want your Valentine to know how you really feel? 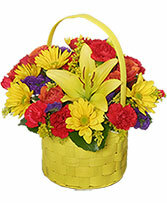 Then be sure to say “Be My Valentine” with this extraordinary Valentines Day gift basket! Saying “Be Mine” has never been easier. 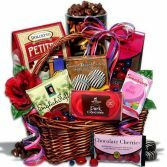 This basket features perfect items for your Valentine including chocolate cherries, conversation hearts, dark chocolate bar, chocolate wafer rolls, chocolate almond crunch, English toffee, gourmet dipped pretzels, and the perfect accessory for our Valentines Day Gifts, Necco conversation hearts! You will never have a better chance to “Be Theirs,” so leave nothing to chance! 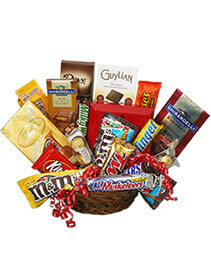 We can guarantee that they'll love this design as it is one of our most popular Valentine's Gift Baskets. Some Substitions made apon availability. 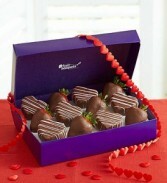 Product Code: 161056 Here’s a sweet surprise you can share with your special Valentine. 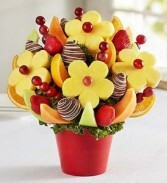 Our luscious fruit arrangement is filled with a mouthwatering mix of dipped strawberries, heart-shaped pineapples, juicy grapes and more. 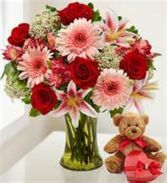 Hand-arranged in a festive red container adorned with chalkboard-style hearts, it’ll bring back all the excitement of young love! 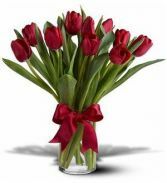 Beautiful and "simply said" red tulips are a hip way to show you care through the holidays. 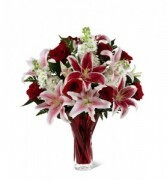 Ten romantic red Tulips arranged in a clear glass vase. 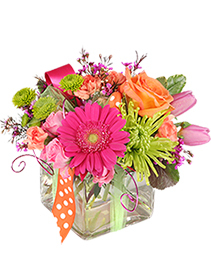 The As Shown version of this product is Approximately: 12" (W) x 14" (H), if you upgrade to the Deluxe version the designer will create a larger more full version for you. 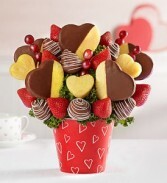 There’s no sweeter gift for your sweetheart than 6 large, ripe chocolate-dipped strawberries—except when they’re joined by 6 heart-shaped pineapple slices, dipped to perfection and topped with pink drizzle. 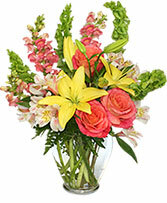 It’s a pairing that’s hard not to love.